“That was her saying, ‘I really love you guys, I’m really going to miss you guys,’” explained Hickenlooper senior media adviser Maximillian Potter. Feel free to offer other suggestions, PeakNation™. 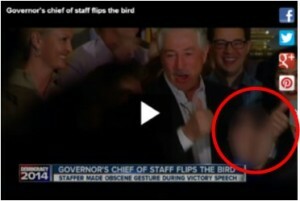 All we can say is if flipping off her staff is a sign of endearment, then, we would hate to be on her bad side. Pardon Dunlap? No Poisson Dunlap. Put a 30 round MagPul magazine under Hick's pillow and in every magazine rack in the mansion.